This is Day 2 of a series. You may want to check out the previous day to start at the beginning. Let me just start out by apologizing I really wanted to get this post up on schedule, but circumstances foiled my attempt. My computer crashed yesterday, and when it restarted it got stuck in a loop that lasted for 8 iterations and a trip into my Windows 7 partition. I was seriously afraid that I had lost my computer for good, but thankfully it recovered (just not in time to still have internet access, so I lost my chance to post last night). So, here it is now. There were a couple of movies last year that I was excited for that ended up failing to meet expectations. One of them I had waited for it to be made for years, and the other one I had seen a trailer for that made me think "oh, this looks promising." Unfortunately, they were not what they should have been. These are The Losers of 2013. Let's get this out of the way first: I loved Tron: Legacy. I thought that it was a beautiful looking movie that also had a well developed plot and a killer soundtrack. Although most people seem to agree with me on the first and last points, it's the middle one that people seem to disagree with me on. I don't care, I still think that it's good. 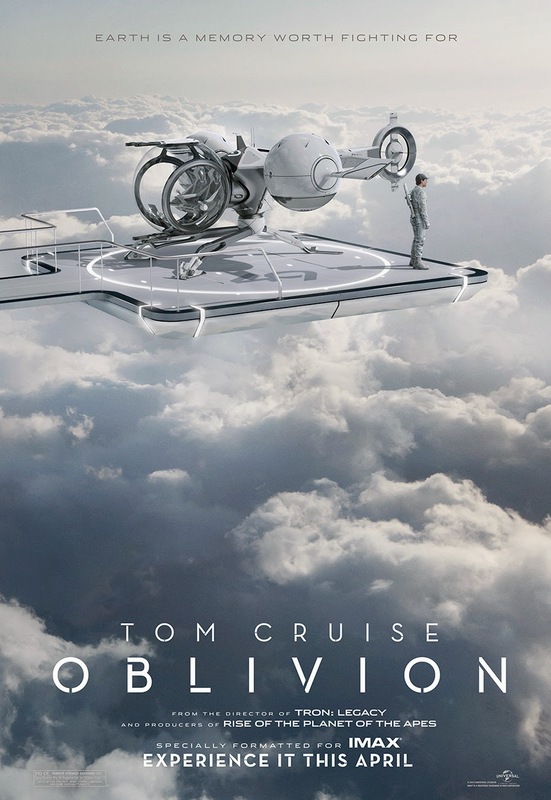 Oblivion is the newest film from the director of Tron: Legacy, and most people seem to be saying the same things about it that they did about that movie. This time, however, I'm inclined to agree with them. Oblivion is absolutely gorgeous. Seriously, the visuals are astounding. The basic setup of the movie is that aliens invaded Earth and in the process of defeating them, humanity ended up ruining the planet. Now there are two people working as mechanics on the surface, repairing drones to protect energy gathering facilities in order to escape to Titan, Jupiter's moon. As I'm sure you can imagine, the post-apocalyptic setting makes for some very pretty landscapes. Sand dunes are piled up to the tops of skyscrapers, bridges are buried under the new deserts, and the entire world has this feeling of vast emptiness. It's not just the scenery that's good looking though. It's set slightly in the future, so there are new technologies that exist and are pretty much the most awesome things ever. My personal favourite (and probably most people's favourite) is the bubble jet (or whatever it's called). It's a super fast aircraft with hover capabilities where the cockpit is inside of a glass bubble so the pilot can swivel around independent of the aircraft's frame. That's cool in itself, but it gets even more awesome when you realize how that means the aircraft can takeoff by doing a backflip. So cool. It also comes with a motorcycle that can collapse down to the size of a suitcase and be stored in the back for ease of transport. I must say, a collapsible / expandable motorbike would be nice to have. There are a lot of cool displays in the future too. A glass table can double as a touchscreen where the information on it can be modified in real time, in a Minority Report sort of way. In the bubble jet, the entire glass bubble acts as a HUD (Heads Up Display) in order to show radiation zones or waypoints or any other relevant information to the pilot. In the house, the walls are glass and act as touchscreens, so the "door unlock" button is displayed on the glass wall right next to the door rather than having a keypad to enter. Aside from the visuals, the other part of the movie that I absolutely adored was the soundtrack. It actually reminded me of the Tron: Legacy soundtrack, but this time it wasn't done by Daft Punk but was instead done by M83 (at least in part). The background tracks aren't super distinctive or memorable, but they do a great job complementing what's happening on screen. But, just like in The Hobbit, the true gem is the credits song, which was definitely done by M83. The extended cut of the song is something like 10 minutes long, so I've looked it up in order to study with several times. On a less technical side, the actors that they picked did a really good job for the most part, considering what they were given to work with. Tom Cruise plays the main character and Morgan Freeman shows up at one point, but those are really the only two actors that I know in the movie. In any case, Tom Cruise does a great job being Tom Cruise (a.k.a. being short and getting into a lot of fights) and Morgan Freeman is on top of his game (a.k.a. being old and giving out advice). Plus, by watching the movie you get to listen to Morgan Freeman talk, and who wouldn't want that. Unfortunately, no matter how pretty it looks and sounds or how good the actors are, there's no fixing a messed up screenplay. Not only are large parts of the script cliches, but the movie has some serious pacing problems. There are something like three separate climaxes, which ends up causing a very bumpy path to the end, rather than the one cohesive arc that it's supposed to be. There were several times when I thought "Well, he's done that now. I guess the movie is just about over." It was never over. I mean, it obviously ended eventually, but it just felt like it was dragging on forever because it kept faking the audience out with possible endings. When there are 40 minutes left in the movie and you already feel like it should have ended twice, it's pretty obvious that something is wrong. 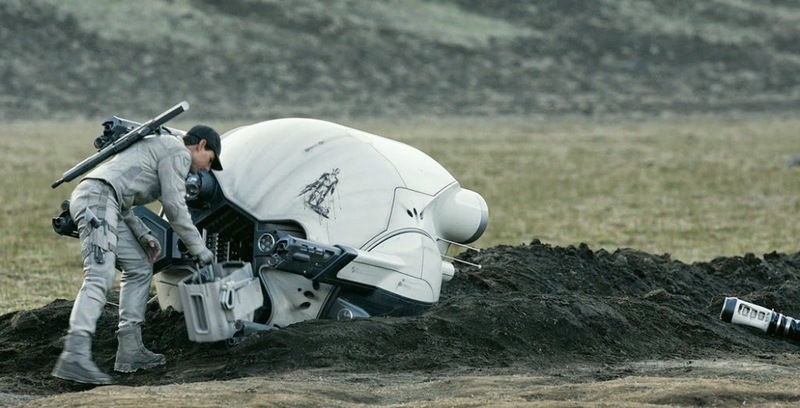 Tom Cruise doing his day job as a war drone repairman. One of the biggest problems that I had with the movie was how it handled its twists. Like a lot of movies, it had a "you thought this was the truth, but really it was a lie the whole time" moment, which can be awesome if it's done right (case in point: The Sixth Sense). The problem here is that Oblivion had two or three of them. It just felt excessive, but that's not even the worst part. The reason that I was so disappointed was because the trailers gave the very first twist away! Granted, it was a pretty predictable twist, but I still think it was probably the one that was handled the best. I hate spoilers, so having the trailers do that is just infuriating to me. I could go on even longer, but I'll finish off this off with another big complaint: I have no idea what the point of this movie was. I don't mean that in a "oh, that was just a dumb action movie" sort of way. This movie really seemed like it was trying to say something; like it had some important message. I just have no idea what it could be. At first it seems like it could be some sort of environmental message, but it becomes pretty clear that's not right. For a while it seems like it could be saying something about the nobility of sacrifice, but just a little while later it completely undermines that message. I really don't have any good ideas. So, you can see that the movie was just a bit messy. Yes, I was disappointed, but it was still a lot of fun to watch (and make fun of with friends). I really only cared about the movie because I happened to see a trailer for it; it's not like I was waiting years for it to come out. But that's the situation for the next movie. The Batle School station. So cool. 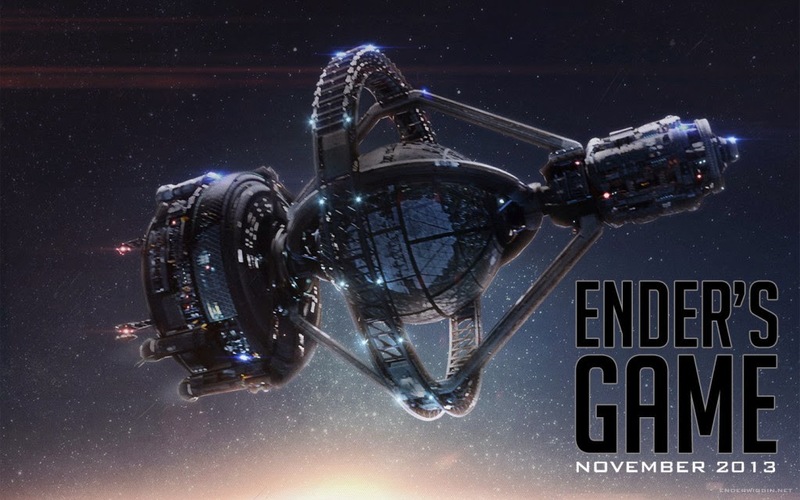 I loved Ender's Game when I first read it a couple of years ago. It was exciting, it was intellectually stimulating, and it was a lot of fun to read. Like I said yesterday when talking about The Desolation of Smaug, I understand that books and movies are different from each other. I wasn't disappointed in Ender's Game because they cut my favourite part out or because the characters weren't how I imagined them to be or anything petty like that. No, I was disappointed in Ender's Game because it was a bad stand-alone movie. Without having read the book, it just doesn't work. 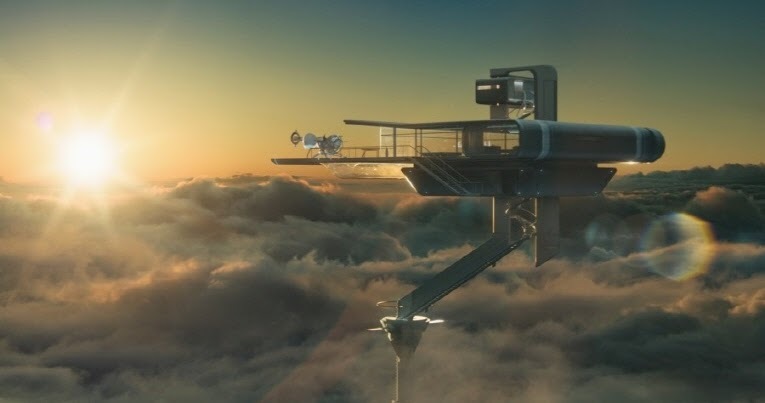 If you don't know the story of Ender's Game, it actually has a very similar setting to Oblivion. Aliens found Earth and attacked. They were defeated, but humanity is afraid that they will come back even stronger a second time and finish them off, so they have been training children to be leaders in the military for the inevitable second war. Ender Wiggan, the main character, is one of these children. It's a pretty simple setup, but the book (and the movie to some extent) gets into the psychology of the children that go through this program as well as how the alien invasion has affected the politics of Earth. 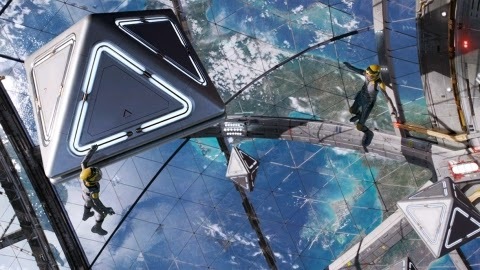 The majority of the story takes place at Battle School, a space station that's orbiting the Earth (the picture up above). It has artificial gravity, but at the very center of it is the Battle Room, a zero-g environment where the children practise their fighting, teamwork, and strategy (the pictures below). This was a super awesome part of the book, and it was super awesome in the movie too, but there were only two battles shown. The battles were the part that were the best suited to being in an adaption, but in order to fit into a two hour movie, things had to be drastically cut down. This is inside the Battle Room, the center of the school. Since it's a story focused on a bunch of kids, it's obvious that there are a lot of child actors in the movie. Child actors are often hit-or-miss when it comes to their actual acting talent, but for the most part these ones did a good job. In the book, the kids are supposed to be around 8 years old, but in the movie it was bumped up to 12, which I'm sure helped. Ender is played by Asa Butterfield, also known as the kid who played Hugo in Hugo, who did a fantastic job. There were a couple of scenes that felt forced and poorly acted (like one time that Bean and Ender are in the Battle Room), but on the whole they did good. As for the adults, Harrison Ford did a good job being gruff in the role of Col. Graff, and the person who played Maj. Anderson (apparently a black woman in this version) did a good job too. Now, there are a lot of things that were cut out of the movie, presumably for the sake of time. The subplot on Earth with Ender's siblings was cut out entirely, but they could easily put that into the sequel if they make one. They cut out most of the mind game (a psychiatric video game) sequences, but they left enough in that it still worked. But what they cut out that they shouldn't have was the battles in Battle School. The movie was only 2 hours long, so I feel like they could have added in another half hour of battles. Having extra time in Battle School would have allowed them to show Ender's true genius, as well as showing his character develop into the leader that he was being trained to be. Unfortunately, they cut it, so it ended up feeling a little rushed. Zero-g environment. Don't you want one? Also, this is the first gif that I've used. Just as a point of interest. Those are some of the reasons why someone who had read the book would possibly not enjoy the movie, but as I said earlier, if you hadn't read the book, you wouldn't enjoy the movie. The reason for this is pretty simple: the movie doesn't take the time to explain anything. The worst example of this is in the last third of the movie. Something called an "ansible" is mentioned once with no explanation of what it is or how it works, even though it's what allows the end of the story to work. Also in the last third, a character returns that we assumed was gone for good, but no explanation is given for how it's even possible for that character to be there. If I hadn't read the book, I'm sure I would have had no idea how to interpret all that. So the adaption wasn't good enough to please the members of the audience who had read the book, but it also wasn't stand-alone enough to have it make sense to the people who had never read the book. It's very extremely difficult to please both groups at the same time, but you should at least be aimed towards pleasing one of the groups, not neither. As a result, I call it a disappointing movie. It did not succeed at either of its goals. After waiting so long for the movie to be made, and then for it to be as disappointing as this, it was a major letdown. So, those were the movies that I was disappointed in this year. Next up is the final post on the movies that I actually enjoyed. Hopefully that will actually go up tomorrow on schedule, but don't be surprised if it doesn't due to travelling.